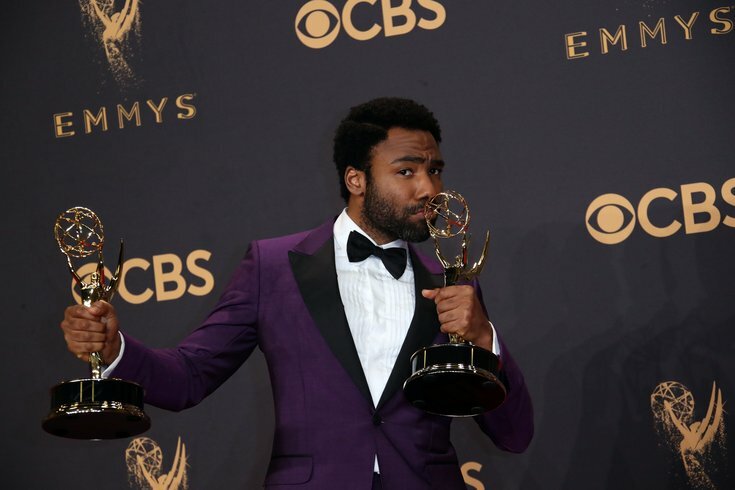 Donald Glover poses with his Emmy awards for Outstanding Lead Actor in a Comedy Series and Outstanding Directing for a Comedy Series for "Atlanta." The first in a trilogy of new “Saturday Night Live” episodes was nothing if not full of famous faces, including that of adult film star (and former paramour of our nation’s president) Stormy Daniels. Donald Glover was the episode’s host and musical guest (as Childish Gambino), just a few weeks shy of the premiere of “Solo: A Star Wars Story,” where Glover plays Lando Calrissian. Ahead of Glover’s monologue, however, Daniels appeared opposite Alec Baldwin’s Donald Trump in the cold open. Ben Stiller (as Michael Cohen), Martin Short (Harold Bornstein), Scarlett Johansson (Ivanka Trump), and Jimmy Fallon (Jared Kushner) also appear in a game of phone tag. Check out some other highlights from Saturday's episode below. Glover reveals he auditioned for “SNL” twice before making it big, but he’s not bitter about not making the cut -- observe as he tries to outdo the rest of the cast, all to the backdrop of a jazzy tune. Dr. Angela (Cecily Strong) is a therapist that helps Friendos -- a parody of Migos, famously loved by Glover -- work through their friend group problems. Glover does another musical parody, this time offering an 1980’s-inspired stalker song targeted at the entirely wrong person. Like “A Quiet Place,” except it’s way harder to keep quiet as Kanye West’s Trump-supporting tweets keep popping up. The episode would be terribly amiss not to include any “Star Wars”-related sketches, especially just a day after May the 4th, so we get to see Glover don Lando’s famous cape as his character holds a summit for all of the black people in space -- which turns out to be a very small group. “SNL” returns next Saturday, May 12 with host Amy Schumer and musical guest Kacey Musgraves.